Good morning. I am pleased to be at the University at Albany. It is always a pleasure to speak with students and faculty because of the intellectual leadership role you play in your communities. I also welcome the addition of business leaders to this gathering because you shape the economic landscape in the region. So, I thank you all for coming today and helping make this such a rich audience. Each visit within the region helps me deepen relationships with the people I represent. As you may know, the New York Fed's District includes all of New York State; 12 counties in northern New Jersey; Fairfield County, Connecticut; Puerto Rico; and the U.S. Virgin Islands. In August, I met with community leaders, businesses and elected officials in Newark, Patterson and Jersey City. Earlier this year I went to Brooklyn, the Bronx, Queens and Puerto Rico, while last year I visited several upstate cities. My trip started yesterday with a policy speech to the West Point cadets and was followed by a colloquium with their economics faculty. So, this visit to the upper Hudson Valley brings me in contact with some of our country’s future leaders—you and the cadets who will lead our country in very important, if different, ways. I will also have a chance to see more of what makes Albany so distinct from both downstate and Upstate New York. Of course, I may have a leg up on this because I was born and raised close by, in western Massachusetts! The greater Albany area is home to 900,000 people—roughly the size of three average cities in the United States. You and your fellow residents tend to be highly educated and be employed as public servants. These factors are all part of what makes Albany feel special. Today, I want to talk with you first about the Fed—what we do and why we do it. Then I’ll give you my views on the economy nationally and locally. It’s a serious issue because it affects your family and students’ job prospects at graduation time. I am vice chair of the FOMC—a Federal Reserve committee that meets eight times a year in Washington to set interest rates and make other decisions about monetary policy. The members of this committee all strive to set policy to advance the mandate given to us by Congress to promote the maximum level of employment consistent with price stability. Sometimes we have different views on the specific policy choice on hand, and you should view this as completely appropriate: these are hard questions— particularly at times like this—and we make better decisions as a committee because we don't all think alike. But we are united in our commitment to our mandate and in our belief that Fed independence is essential to the public interest, because it allows us to take tough decisions insulated from short-term political pressures. At FOMC meetings, each Committee member presents a current outlook for his or her region and the nation. For these assessments, we consult our researchers and add critical information that we learn from listening to our boards of directors, regional advisory councils and community leaders, such as you and others I'll meet on this visit. This trip includes meetings with the people at the SUNY Nanotech Center, Global Foundries (an advanced microprocessor plant), the Capital Region Economic Development Council, and the Rensselaer Polytechnic Institute. At the New York Fed, we continually track conditions in our District, and we have created a number of tools for that purpose. For example, my staff produces monthly indexes of economic activity for New York City, New Jersey and New York State. These indexes are essentially local measures of output—similar to gross domestic product, or GDP at the national level. These measures provide a more complete gauge of activity than the employment report, which is the only other available metric at the state level. We have also started a consumer panel to track local household credit conditions, including the amount and type of debt owed by an average person and whether payments are being made in a timely way. In addition, we have a new poll about credit and financing for small businesses, the latter are an important source of new jobs. The survey asks firms about credit applications and reasons for not seeking credit. Almost 900 regional businesses responded to our May 2011 poll, of which nearly 15 percent were from the upstate region. The next poll will be in January. If you, as part of a small business, would like to participate in our January poll, please pass your card to my colleagues in the audience. Next month, we will host a workshop for the New York City metro area's small businesses—to provide information about how they can participate in the global economy and expand their companies by exporting their products and services. The Export-Import Bank, the Small Business Administration and the U.S. Department of Commerce will be on hand. They will tell participants how to tap demand in the global marketplace and what government programs are available to enhance credit, reduce payment risk and increase lines of working capital. We are also facilitating a “speed mentoring” forum in which small businesses will receive feedback on their business plans and advice about applying for financing from a range of finance professionals. In 2012, we’re planning similar events in the capital region. We hope to partner with many of you to support the small business sector. As you know, even states as wealthy as New York have large pockets of poverty. So, we target some key initiatives specifically to low- and moderate-income groups. We have worked hard to help neighborhoods that face high foreclosure rates. For the past three years we have provided housing advocates, including the Empire Justice Center, with the latest information on mortgage conditions, via roundtables, presentations and newsletters. To share what we learn about our diverse District, we have a rich website. I invite you to visit newyorkfed.org to explore our highly localized maps and information on small business, credit and housing conditions and even the latest job openings at the New York Fed. We stand here today several years after the worst financial crisis in modern times. The origins of the crisis are complex, but it had its roots in the bursting of a credit bubble that had grown to great size during the middle part of the last decade. Prior to the onset of the crisis, a combination of rapid financial innovation and imbalanced global economic integration resulted in a mispricing of risk worldwide. This was particularly extreme in certain markets such as U.S. housing and housing finance. This mispricing of risk led to a misallocation of resources and an excessive build-up of debt in many parts of the global economy. Many—though not all—U.S. households responded to the easy availability of credit and rising home prices by taking on more debt. When the housing boom lost steam and began to burst, expectations about housing prices and wealth were disappointed. The bursting of the credit bubble also created instability within the global financial system and, this, in turn resulted in a sharp drop in the credit available to households and businesses. The result was what is now called the “Great Recession.” Over the period from late 2007 through mid-2009, real GDP declined by more than 5 percent, making this recession the longest and deepest recession of the postwar period. The recession was felt in many ways, but one of the most painful was the severe impact it had on the labor market. Employment dropped sharply during the recession, contributing to a sharp rise in the unemployment rate from around 4.5 percent in the middle of 2007 to over 10 percent in October 2009. Extraordinary actions by authorities around the world, including the Federal Reserve, prevented full-scale financial and economic collapse, and the global economy stabilized around mid-2009. But since then the recovery has been bifurcated. While emerging economies have rebounded rapidly, the developed world has grown only slowly. This has hastened a historic shift in the balance of economic power that was already underway before the crisis. Although the latest news on the U.S. economy is somewhat more encouraging than that from earlier in the year, we should not take much solace from that. After a very weak first half, when GDP growth was less than 1 percent, economic activity has strengthened somewhat and inflation pressures are starting to ease. Growth in the third quarter is currently estimated to be 2.5 percent, and recent indicators suggest growth in the fourth quarter could be somewhat higher. This modest rebound reflects in part the passing of transitory factors such as the damping effect on household and business spending power from rises in energy and food prices as well as the supply disruptions related to the earthquake and tsunami in Japan. However, as we look toward 2012, the U.S. economy continues to face several obstacles to a robust recovery. Accordingly I expect growth of about 2.75 percent for 2012. Consumer price inflation has begun to moderate. This moderation is just starting to become evident on a 12-month time horizon—in which consumer price inflation as measured by the consumer price index (CPI) is rising at about a 3.5 percent annual rate. Given current expectations for the path of energy prices—taken from futures markets—consumer price inflation on a year-over-year basis should continue to fall over the next few months. We cannot be satisfied with the current state of the economy or the outlook for the next few years. The economy is operating far below its productive potential –leaving the level of output, income and employment much lower than they would be if the economy’s unused resources were put to work. One summary statistic says it all—the unemployment rate is unacceptably high at 9 percent. Given my outlook, the decline of unemployment over the next year is likely to be modest. Furthermore, we also continue to face significant downside risks, mostly related to the stress in the eurozone. In a speech yesterday at West Point, I highlighted the need for our nation to deploy a full set of economic policy tools to secure the recovery and build for the long term. This includes monetary policy, but also requires policies to help repair housing markets, fiscal policy that supports growth in the short and long run, and structural reforms that increase competitiveness and support a shift in the pattern of economic activity toward a more sustainable growth path than that which prevailed during the last business cycle upswing. How is the recovery proceeding in the state and the region? As I mentioned, the New York Fed produces economic activity indexes to help monitor conditions in New York State.1 Based on our index, the downturn in the state’s economy ended in November of 2009. Since then, I would describe the state’s economy as recovering at a moderate pace, although there appears to have been a pause in September. The New York Fed also conducts the Empire State Manufacturing Survey to learn about conditions for regional manufacturers. I am pleased to say that November’s report (issued this Tuesday) shows signs of stabilizing after five months of weakening. In November, more manufacturers are adopting an optimistic outlook. Like many other large states, New York has a bifurcated economy. New York’s downstate area differs dramatically from the upstate area in terms of industrial composition, occupations and job growth. While Albany may be geographically midway between the two areas, its industry mix resembles neither the downstate’s heavy concentration in the service sector, nor the upstate focus on the manufacturing sector. What sets Albany apart is that it is home to the state’s capital. About one quarter of employees in the Albany area work for the government—about a third more than the statewide average. In contrast, I am pleased to say that Albany’s private sector is showing signs of recovery. Your private employers have been adding jobs at a fast enough pace to offset the public sector job losses. However, this job creation has not been robust enough to bring down the unemployment rate, which remains at 7 percent of the workforce. That is a lower rate of unemployment than the national rate, as is usual for Albany. However, it is almost double the jobless rate in early 2007; and it has barely budged since the recession ended. It will be difficult for growth in the region’s economy to resume and for unemployment to decline until the public sector stabilizes. An important plus for the local economy is the capital region’s housing sector, which has weathered the economic storm relatively well. As a result, the drop-off in economic activity that is connected, directly and indirectly, to the performance of the housing sector has not been as severe here as it has been in many other places around the country. Like much of Upstate New York, Albany’s housing market has proven more stable than much of the rest of the country. During the 2000-2006 housing boom, Albany’s house prices rose by 85 percent, much higher than the roughly 50 percent average increase in Upstate New York as a whole and almost as high as the doubling of house prices seen nationally. Unlike the rest of the nation, though, the region’s housing market has been comparatively stable since then. Prices have declined by about 7 percent from their peak here, compared with a decline of 32 percent nationally. Nonetheless, declining house prices coupled with a sluggish jobs recovery has increased financial pressures on families. During the recession, all across the nation, high levels of debt led to a soaring number of delinquencies. Many families found that they needed to reduce their debt to more sustainable levels. Drawing on the special consumer credit panel I mentioned earlier I can tell you that these trends have certainly affected people in this area.3 But the good news is that the effects have not been quite as severe here as they have in much of the country. Households in the Albany region did not accumulate as much debt as did households in the rest of the state and country during the run-up to the crisis. Recent data indicate that the average adult in Albany has about $40,000 of debt, which is about 20 percent lower than the average across the state and country as a whole. Thus, financial strains on many families in the Albany area were lower than in many other places around the state and nation. However, the number of delinquencies did rise significantly during the recession in the area, so it is clear that some households face strong financial pressures. About 4 percent of debt balances currently are 90+ days past due in Albany, which is twice the 2 percent delinquency rate in 2005. Although this is less than half of the rate in New York State or the nation, this doubling of delinquencies in the Albany area still troubles me as a sign of heightened distress for many families here. Albany is growing. The recent Census shows that the population in the region expanded by 5.5 percent over the past decade, more than double the statewide average. Saratoga County saw an especially strong gain of nearly 10 percent. Incomes in the region are high. Albany is the state’s most affluent area outside the New York City metropolitan region. Median household income was roughly $57,000 in 2009, moderately above the statewide median and well above the nation’s. Not surprisingly, then, the poverty rate is lower than the U.S. average—11 percent versus 14 percent nationally. Your residents are highly educated. Educational attainment—a critically important driver of economic activity—is also well above the national average. A third of adults who live in the Albany area hold college degrees. 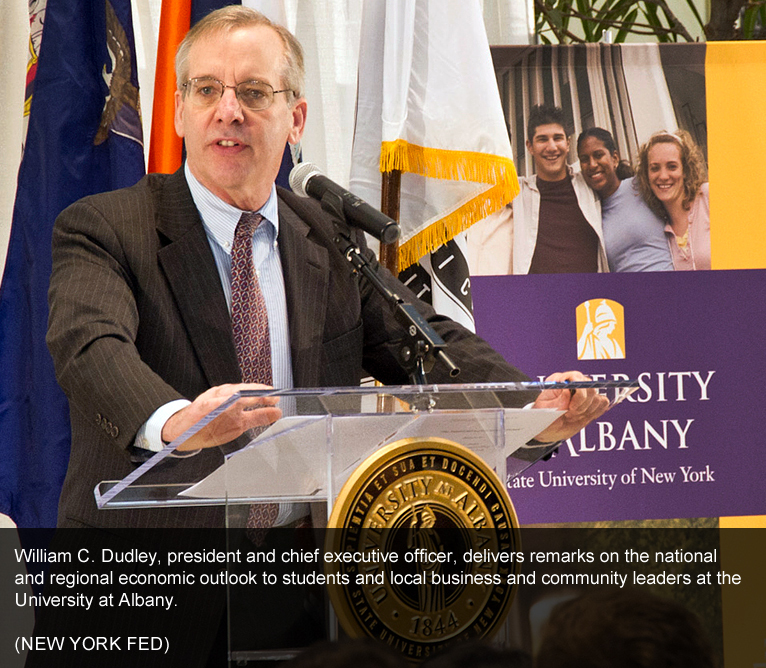 One of Albany’s key strengths is its higher education industry. The colleges and universities in the capital region help stabilize the local economy during downturns and recoveries. Indeed, the private education sector continually added jobs before, during, and after the Great Recession, both nationally and locally. For example, the University at Albany has taken a lead role in shaping the next generation of financial professionals and regulators through its pioneering curriculums. From my perspective at the Fed, a particularly important and timely example is the University’s innovative National Science Foundation-supported program for instruction and research in financial market regulation. Research conducted by the New York Fed has shown that colleges and universities can help build the skills and education of their region’s workforce, which is critical to an area’s ultimate economic success.4 They do this in two ways. Most directly, colleges and universities support an educated workforce by producing new college graduates, some of whom will stay and work in the area. The University at Albany clearly plays this role in the capital area. Perhaps equally important in terms of promoting local economic growth, colleges and universities can play a key role in creating jobs for skilled workers in local businesses. Colleges and universities conduct research and development that can have “spillover effects” into the local economy. Businesses in the region can take advantage of being close to these innovative activities and facilities to develop new products and technologies. This can also help draw new companies to the region to access university resources. Thus, successful industry–higher education partnerships can provide a quite a boost for a region’s economy. The local nanotech sector provides an excellent example of this type of partnership at work. During my visit to the University’s College of Nanoscale Science and Engineering this afternoon I look forward to seeing the facilities and hearing more about the Center’s plans to lead the way in global nanotech research. More broadly, I understand that our audience today includes several members of the Regional Economic Advisory Council—including the University at Albany’s president, George Philip and Michael Castellana, the co-chair of the Council—who are working to advance such partnerships and the outlook for the region. Going forward, the industry–higher education partnerships taking place here will be increasingly important. I expect the strong foundation already in place will help maintain the economic vitality of the capital region. To sum up, growth has picked up modestly in the second half of 2011, but not enough to bring unemployment down. While there are some bright spots in the U.S. economy and the financial system, strong headwinds are preventing a more vigorous recovery. Inflation, which has risen in recent months, is poised to moderate soon. The Fed is doing—and will continue to do—everything within its power to promote jobs and price stability. Looking ahead, the key challenge for the Albany area will be to continue to prepare its residents for the best jobs being created here. Expanding education and skills will go a long way to broaden participation in the economy to all residents. 2 See, for additional discussion of this topic, William C. Dudley. 2011. Job Creation in the Region. Remarks at the Quarterly Regional Economic Press Briefing, New York City. August 12, 2011. 3 Quarterly Report on Household Debt and Credit, August 2011. 4 See Jaison Abel and Richard Deitz, The Role of Colleges and Universities in Building Local Human Capital. Current Issues in Economics and Finance, vol. 17, No 6, 2011.